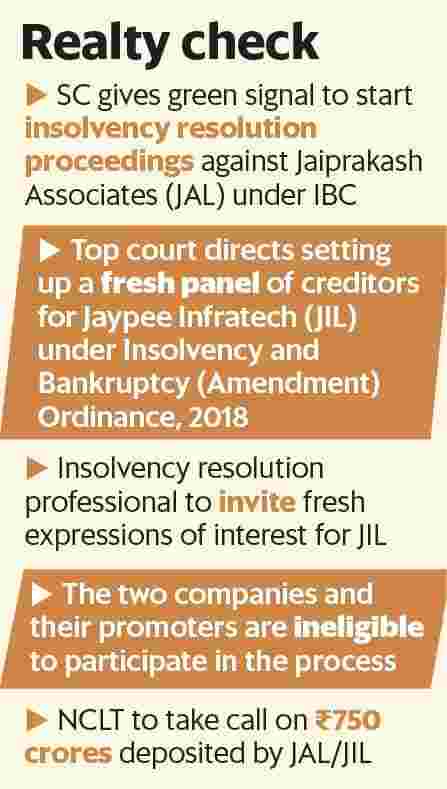 New Delhi: The Supreme Court on Thursday ordered the sale of Jaypee Infratech Ltd (JIL) to investors other than promoters and offered homebuyers a seat at the table, besides clearing the decks for insolvency proceedings against its parent Jaiprakash Associates Ltd (JAL). Under the amended bankruptcy code, homebuyers are classified as financial creditors, and get to decide on a company’s future along with lenders. A Supreme Court bench headed by Chief Justice Dipak Misra also allowed the Reserve Bank of India to direct banks to take JAL to bankruptcy courts. In the last two days, the Supreme Court has sent out a tough message to the promoters of real estate companies, coming to the aid of thousands of homebuyers stranded due to non-delivery of their homes. On Wednesday, the apex court had cautioned realty developer Amrapali Group. “The two cases are different but the underlying message is that homebuyers would gain confidence from it and would feel protected by the court of justice," said Santhosh Kumar, vice-chairman of Anarock Property Consultants. “It also sends out a strong message to the new real estate regulatory authority and to the government as well that there needs to be strictures and regulations to protect customers more strongly." The amended bankruptcy code makes it easier to decide on sale and revival proposals as it requires only 66% of creditor votes, down from 75% previously. “We direct that a CoC (committee of creditors) shall be constituted afresh in accordance with the provisions of the Insolvency and Bankruptcy (Amendment) Ordinance, 2018, more particularly the amended definition of the expression ‘financial creditors’," the court said in its order. Although the 270 days allowed under the bankruptcy code to decide on whether to revive or liquidate a company is over in the case of Jaypee Infratech, the apex court gave the bankruptcy proceedings a fresh lease of life by resetting the resolution process from Thursday, giving it the benefit of another 270 days. This includes 180 days available ordinarily and a three-month extension that the Allahabad bench of the National Company Law Tribunal, which will now oversee the case, could give if needed. “We have highest respect for law of the land. We have no more comments to make," said Manoj Gaur, executive chairman and chief executive at Jaiprakash Associates. The insolvency professional will now invite bids for the firm, keeping out promoters of JIL and JAL. Under the bankruptcy code, promoters can bid for winning back their firms only if they repay dues to creditors. The three bidders who have evinced interest will get another chance to revise their bids. They are Adani Infrastructure and Developers Pvt. Ltd, a consortium of Lakshdeep Investments & Fin-ance Pvt. Ltd and a consortium of Cube Highways and Infrastructure Pte. Ltd and Kotak Investment Advisors Ltd.